Last month, I was told by Topshop that they'd chosen me as their affiliate blogger of the month. Ha - can you believe it? I think the green sandals swung it :) but yay to them for picking an old bird for this accolade. 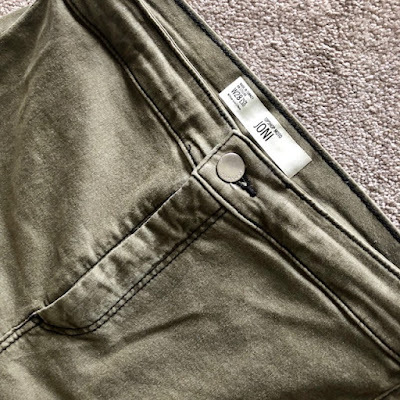 Anyway, my reward was a £50 voucher to spend on my favourite item and I played safe and chose my old faithful Joni skinny jeans but this time in the khaki colour way. I've had khaki jeans before from a couple of different places but I never quite got on with them. 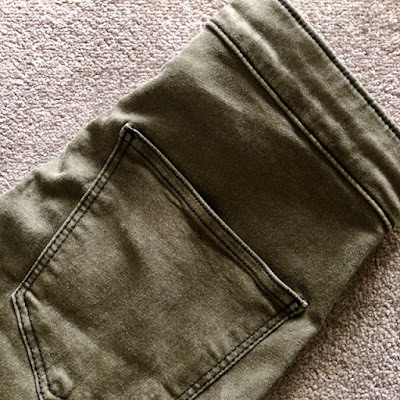 I think when they're not black or denim blue, jeans can be quite unforgiving and you need to pay a bit more for a good quality fabric and the right colour. I have Joni's in black already - coated and non-coated. They are just so comfortable - akin to a legging really - as they're high waisted, super stretchy and don't have front pockets so there's no extra bulk or detail on the place where I want as little detail as possible, my tummy area. Been meaning to give this bag a shout out on here for a while. My husband bought it for me for my birthday - or I should say, I bought it on his behalf. It's by Gianni Conti and I saw it first in McKillens when I was up in Ballymena in May on the blogger day they held. I took a few photos and couldn't stop thinking about it. Loved the shape and the size and the leather is exquisite. 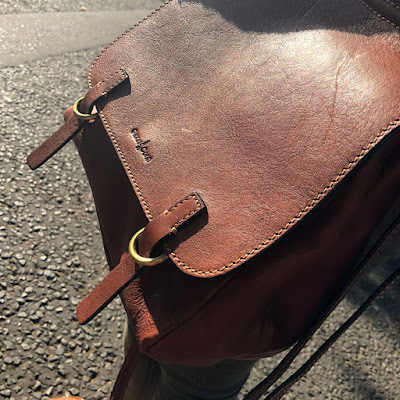 I was looking at preloved Mulberry tan bags as a possible birthday gift but I just kept thinking that the Gianni Conti one was actually a nicer bag. It's got a wrist strap as well as a cross body one so it's way more practical too. 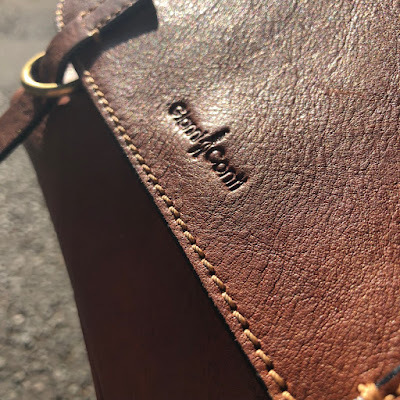 I can't see this particular style anymore online, which is a real shame but do take a look at their latest range as there are some amazing designer dupes in stunning real leather for a fraction of the price. Well priced given the leather is dyed using traditional Italian methods and each bag is hand made. To give you some idea of cost, my bag had an RRP of £189. I got it on a 20% off day so it worked out at £150. I've seen them locally in McKillens (obviously!) and also in Moores in Coleraine. 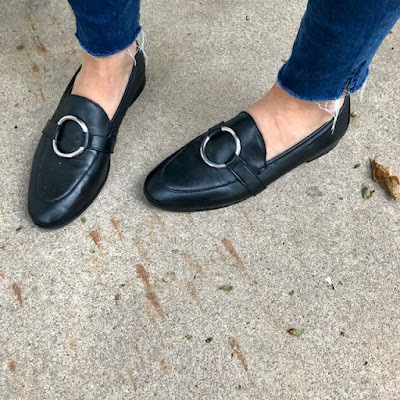 I also picked up a pair of black loafers partly paid with what was left of the Topshop voucher - these were reduced in the sale to £25 - leather uppers and leather lined, they're great and I love that they have silver hardware. I'm a bit weird when it comes to hardware matching so I often don't wear my Dune loafers as they have gold hardware and don't co-ordinate with my biker jacket or silver hardware handbags. I know - told you it was weird! And here I am wearing them yesterday with an old Warehouse top I rediscovered as part of a massive wardrobe clear out. Jeans are Stradivarius on this link. And yes, you read that right. I'm detoxing the wardrobe again. But I've decided to take the bull by the horns this time and CLEAR out ruthlessly. Watch this space for another preloved sale later this week. 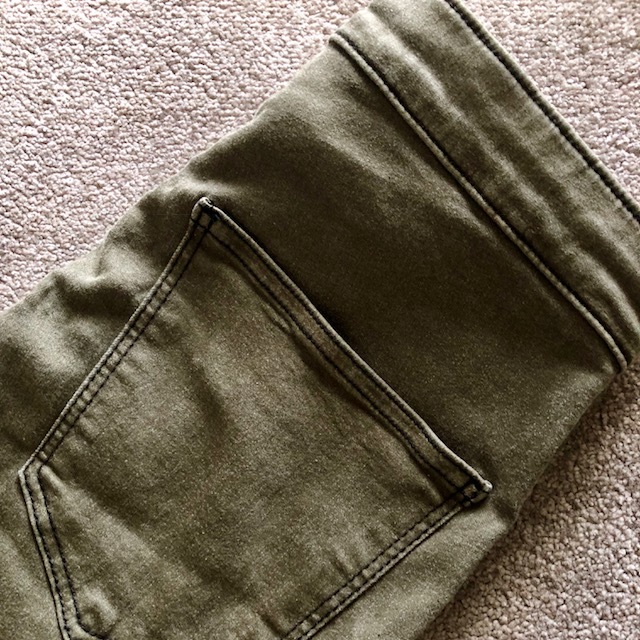 It's all part of a more minimalist approach to this blog - lots of changes coming up over the coming months as I take control of my wardrobe and my social media - and simplify it all. I'm hoping you'll want to join me on the journey. I know I'm not the only person exhausted by it all. Why do fashion bloggers stand and pose so awkwardly in my opinion. I am constantly amazed at their stance, yet followers seem to rave about who they follow! Very strange.